The time of year has arrived when even the most digitized among us turns to paper, envelopes, and stamps to send out cheerful holiday greetings to friends and family across the globe. Nothing can surpass the excitement that is felt when the mailbox is opened and, tucked among the bills and credit card applications, is a personal holiday card with your name (spelled correctly!) adorning the label. 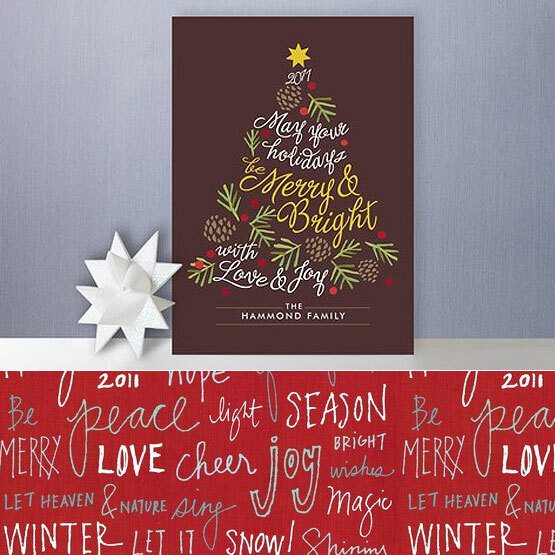 Today's article is presented by the online printing services company offering greeting cards perfect for the holiday season. What is it about receiving a card in the mail that makes it so special? Is it the touch and feel of paper in your hands? Is it the bright colors, texture, or patterns? 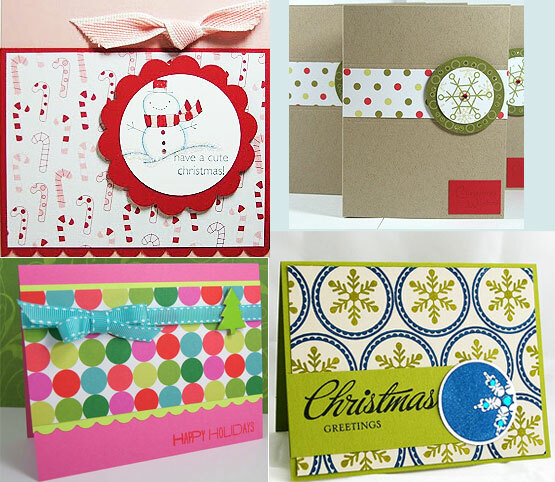 Here is chance to explore some amazing holiday greeting cards, some of which are masterpieces in their own right, and maybe get some ideas on how to incorporate color into your holiday hellos. Words within a shape or using words as a pattern can make a simple and adorable greeting. Do you have any word patterns you've done that you'd like to share? I definitely want to try this with Seamless Studio. This would work for any occasion. 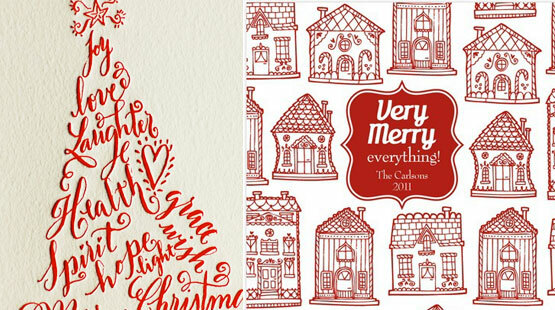 Letterpress (left) in combinations with words as a shape turned out gorgeous. The little houses pattern (right) remind me of some style of Danish design. It's fairly unique and would be fun to create. Anyone up for a Seamless Studio (or Seamless Lite) challenge to make something similar to this? 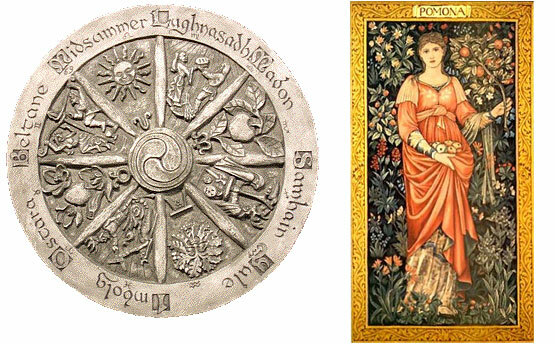 In the top version, the artist traced some shapes out lightly with a pencil, drew some simple pattern work of lines and circles in stripe-fashion (with a permanent pen) within the bounds of the shape and then erased the shape lines. I decided to replicate the method digitally in Photoshop using some COLOURlovers patterns. You could use any graphics editing software that would allow you to create a mask. I created simple shapes (basically copying the ones from the original piece) and then applied the layer Clipping Masking option. Remember to always respect the license of other member creations on COLOURlovers. This wonderful design from TWO PEAS IN A BUCKET member, pescaragirl, would be fun to use as an idea for a card from your own patterns. 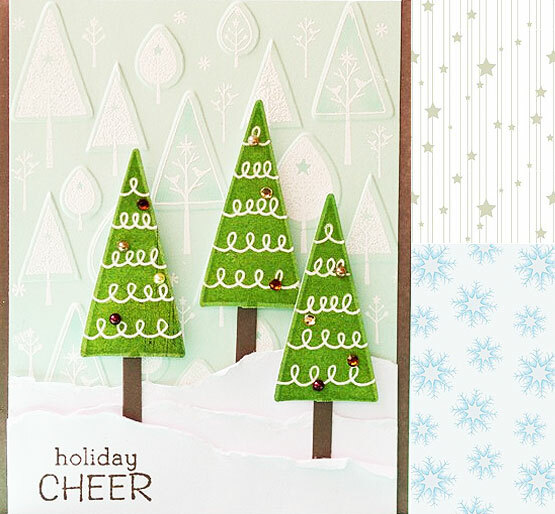 Using a simple, subtle pattern like snowflakes or stars (shown to right) and torn, layered paper in the foreground you could easily whip up some of these. 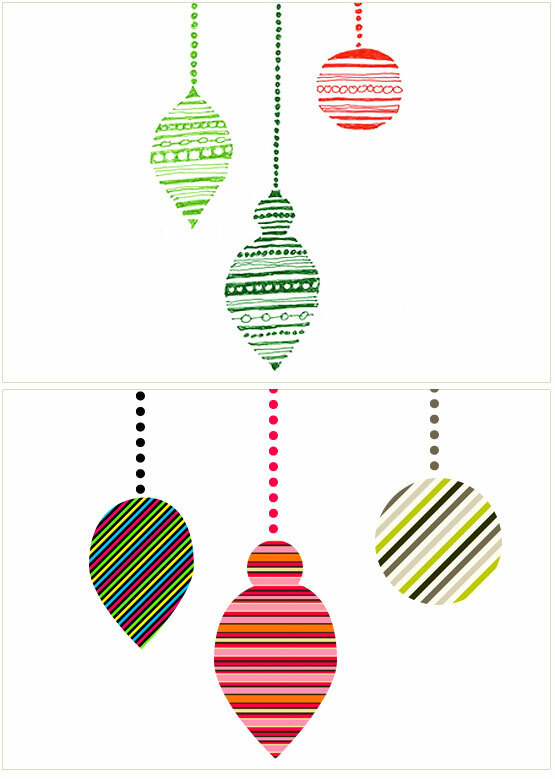 Patterns in general are excellent to use within greeting card design in so many fathomable ways. What patterns would you use? Here are some fantastic examples of layering many different types of patterns and simple shapes. And if all else fails, go with just color! Holiday greeting cards are a fantastic way to connect with old friends, and show your loved ones how much you care. When you go to choose your holiday greeting this year, know that you will not only make someone smile, but you have the chance to give them a decoration to adorn their mantle piece, shelf or even their Christmas tree for years to come. 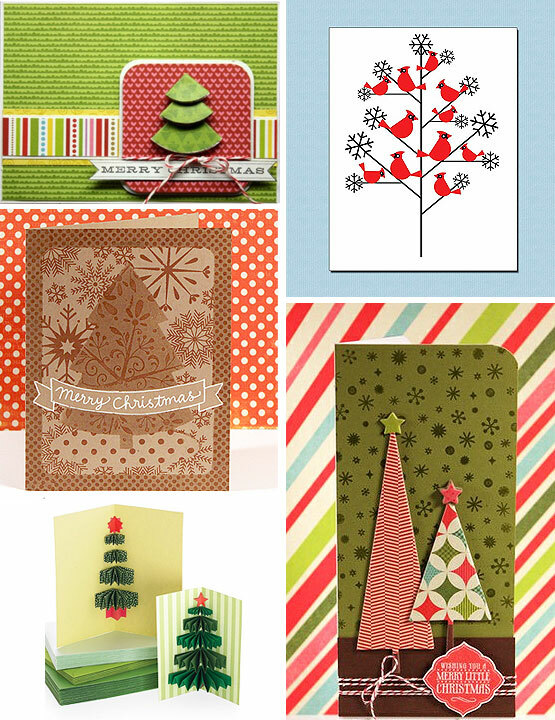 Choose a card that is uniquely you or pick out a small masterpiece that is sure to brighten a cold winter’s day. Original credit for the phrase is given to the plunging gold prices way back in 1864 that started a panic in the stock market, thus a very black Friday indeed. 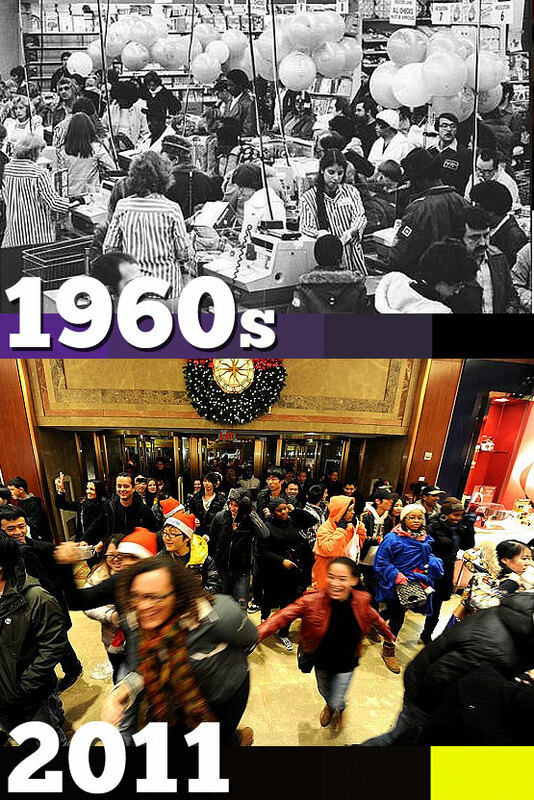 Then, in the late 1960s, Philadelphia newspapers borrowed the phrase to describe the dark masses of shoppers crowding the stores. Sounds kind of creepy I know, but let’s imagine them wearing festive holiday colors and the picture isn’t so bleak. Later on, this idea was clarified to mean that the crowds increased profits, thus the black ink on the accounting balance sheets is why it is called Black Friday. Tweak this theory again and black now represents the day retailers make a profit or break the bank. Ominous, I know. Whatever the origin, by the time the 1990s rolled around, Black Friday had turned into a nationwide retail holiday (albeit unofficial). Since then its fame has grown, and now it is the season’s biggest shopping day of the year (says market research firm ShopperTrak). Whether you brave the crowds, hide at home, or enjoy a regular day at work (with a little crowd control), be safe and have a happy Black Friday from all of us at COLOURlovers! Of all the things to be thankful for, color is at the top of the list. Color is saturated into every fiber of our lives. It gives variety to our days, our moments, our very lives. It is there in our darkest moments and happiest memories. It can influence moods and reactions. It is there for us when we brainstorm inovative ideas, new marketing techniques, or complicated craft projects. Color is simply inspiring. So, on this Thanksgiving Day, remember to take a look around you and notice all the beautiul colors that this season has to offer. How are you celebrating color this season? 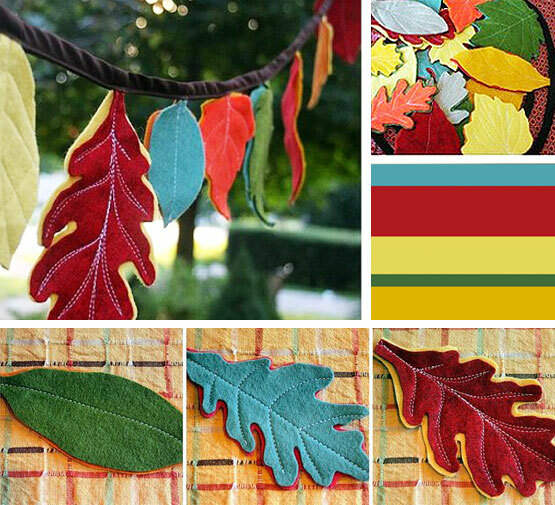 Celebrate color this season with a leaf garland made of felt and yarn. 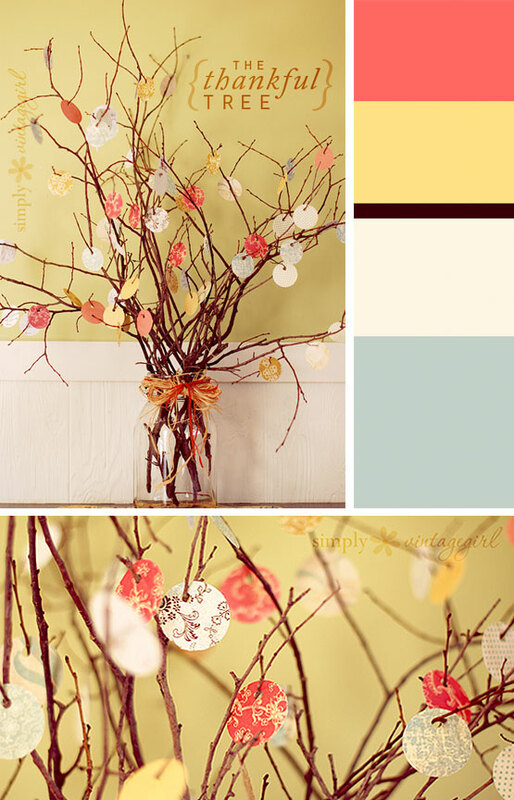 Incorporate a gorgeous color palette into your home's decor without the crunchy mess of real leaves. Dazzling. 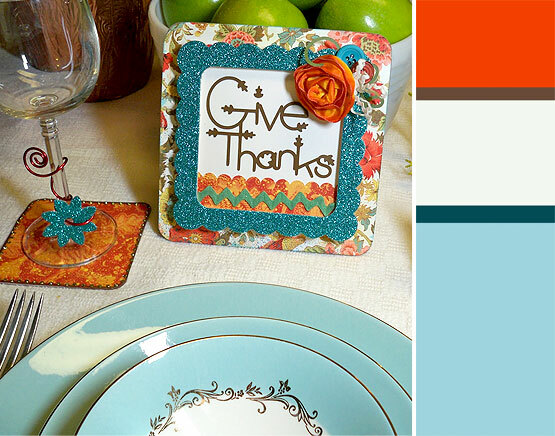 Do you think these sparkly aqua-blue accents steer a little bit away from traditional fall colors? You have to admit, it adds a nice depth to the overall setting and complements that traditional orange nicely. Elegant. 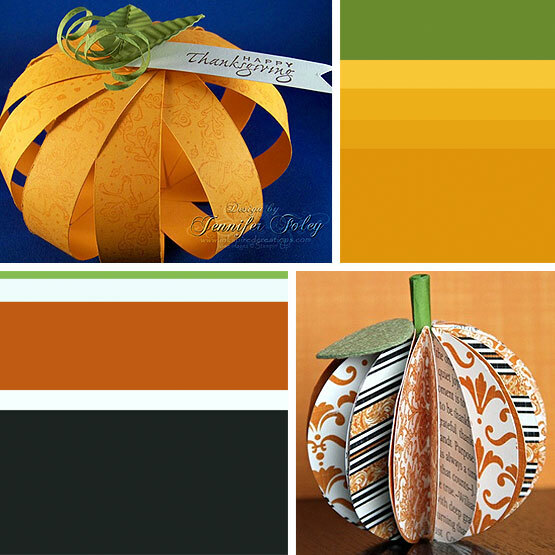 Bring the outdoors in to create thankful bits of autumn pastels and pattern mixtures combined in a "Thankful Tree." For the kiddos. Shades of brown add warmth and provide an earthy feel in this Turkey centerpiece. 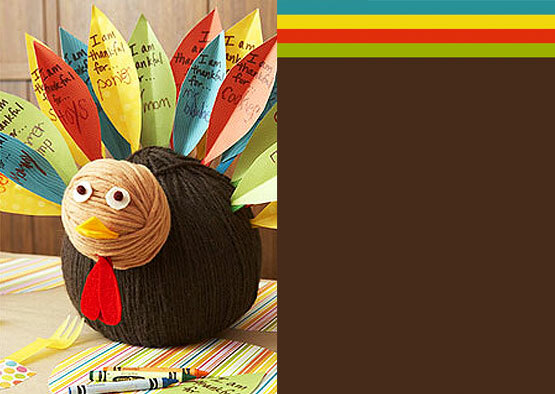 Choose a fun and colorful palette for the thankful feathers. Tradition, (What Are You) Thankful Four? What are you thankful...4? A great excuse to use color in so many ways! 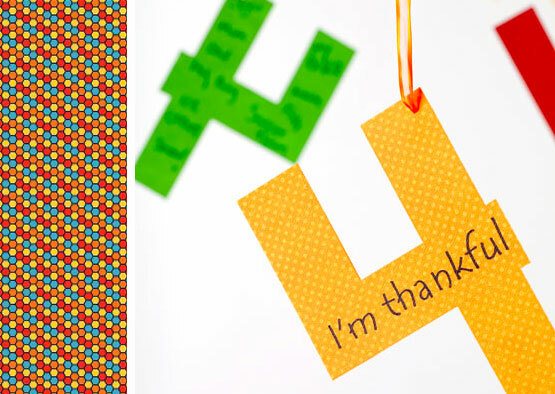 Write what you're thankful for on colorful number fours cut from scrapbooking or construction paper and share. Turn them in to ornaments to display all weekend. Keep them around as reminders. There's always room to go classic. 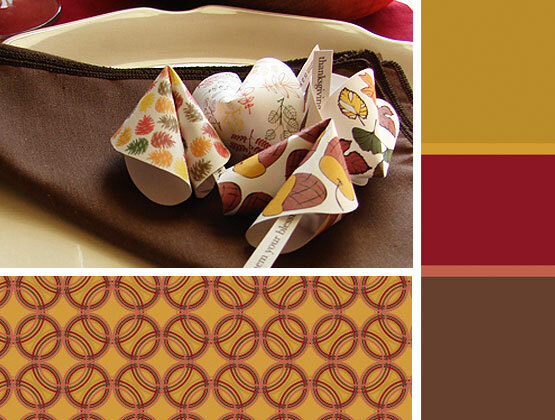 Traditional autumn colors make a space warm and inviting. 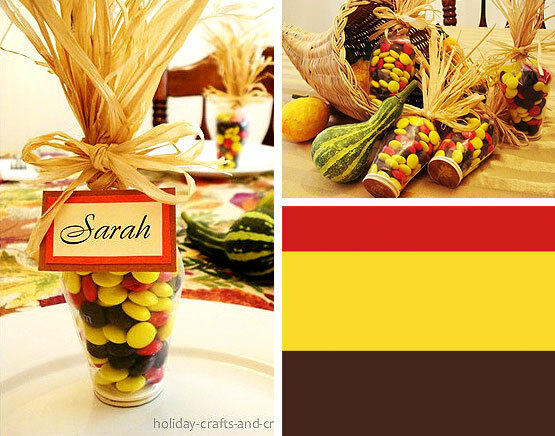 These edible place settings using M&M's to imitate Indian Corn are quite fun! 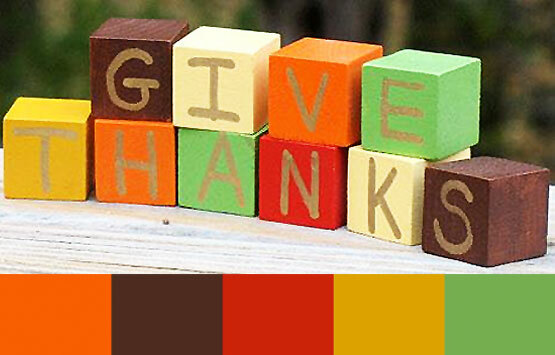 Create a three dimensional palette with blocks and display an appropriately thankful message. 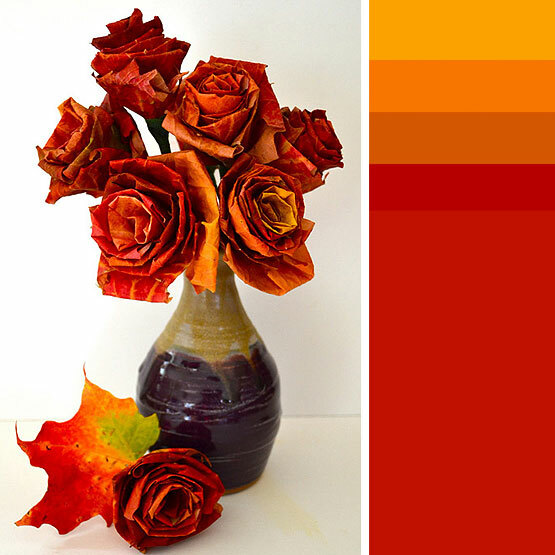 What better way to say thank you to the beauty of color than to use fallen leaves to create vibrant autumn roses. 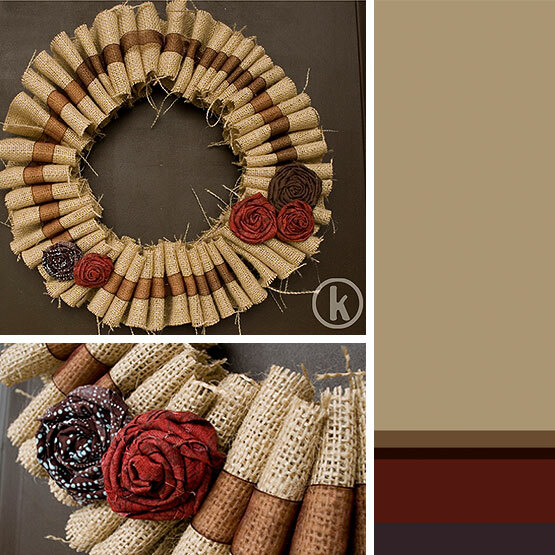 avery & anderson - Fall Decor' Part 4: THANKS be to upcycling wine bottles! 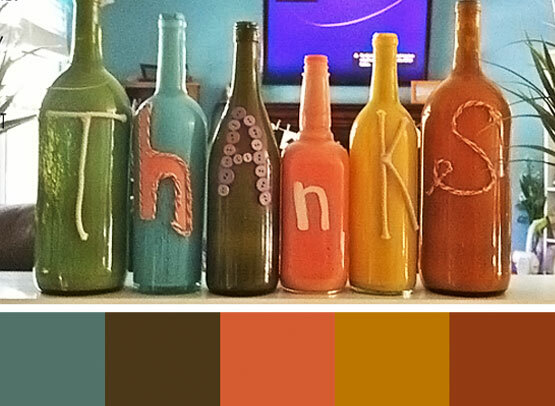 Get funky, use a few recycled wine bottles, a bit of paint and some other odds and ends to create and display a thankful word. What would fall be without a wreath? Burlap offers a very earthy-happy texture, while adding a mix of traditional or non-traditional colors livens it up. Blending tradition with innovation - did you look close enough? I took a double-take after realizing those were bean-balls in the cornucopia! How creative and fitting to the season. 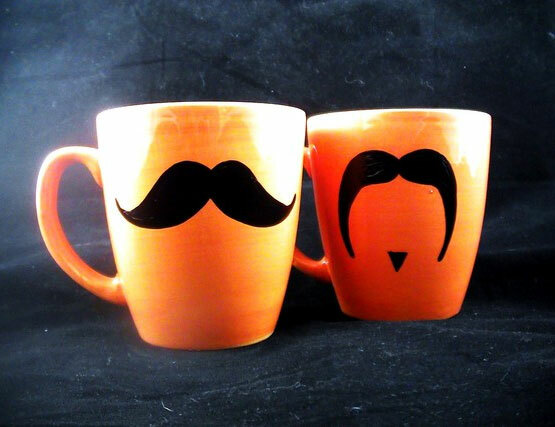 A gentle reminder of warm soup on chilly fall evenings. Autumn wouldn't be autumn without a couple of paper pumpkins leftover from Halloween. Another way to utilize a mix of patterns and palettes. 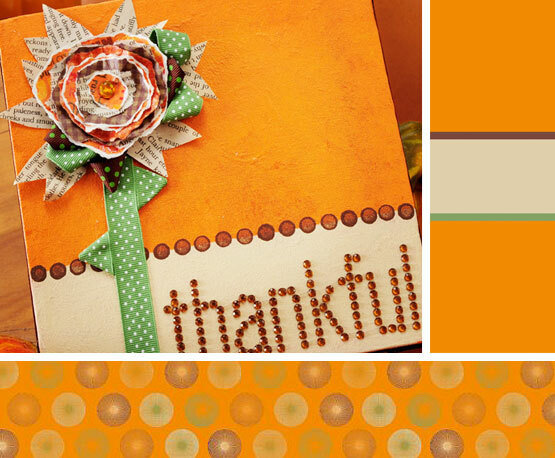 The paper flower on this thankful journal has a nice whimsical feel to it and reminds me of autumn leaves. Writing down what you are thankful for is always a great way to reflect and come back to on days when you aren't feeling so thankful. This simple, yet unique idea encompasses the idea that being thankful can also remind us of the good things that are yet to come. 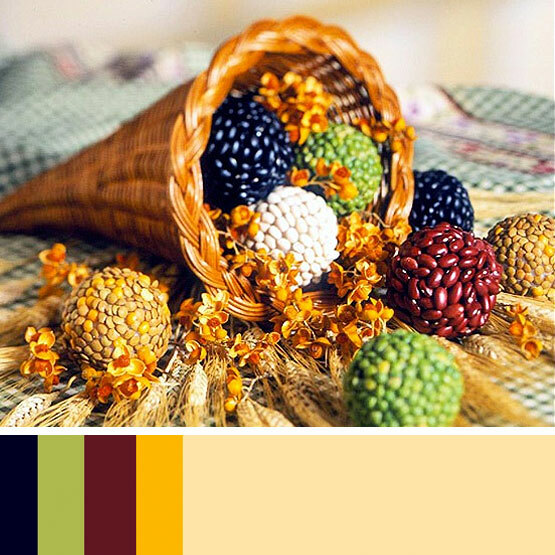 Incorporating autumn colors into our homes and Thanksgiving celebrations is a special way to recreate that warm feeling we experience when we start listing all the things that we are thankful for. This reason, above all, is why color should be remembered on Thanksgiving Day. Can you remember a time when people used to write letters—by hand! Or, read books made of paper, glue and ink? As our increasingly digital world seems to be moving farther and farther away from traditional print media, companies like Paperlux step in to remind us that nothing can replace the touch, smell, weight, and color of a real hold-it-in-your-hands magazine. Today's article is presented by the leading magazine and glossy booklet printing company, Next Day Flyers. 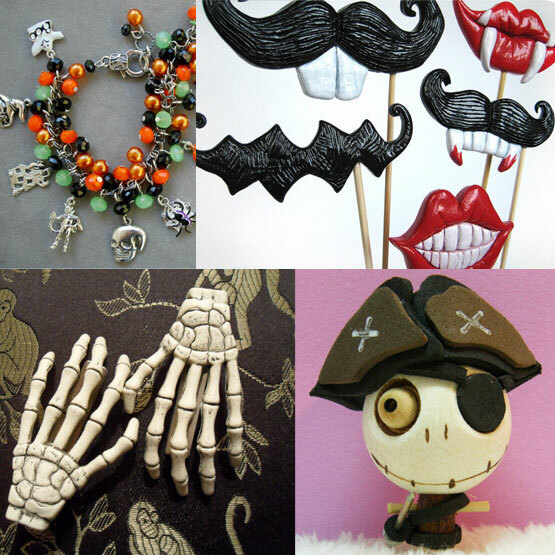 Check them out for fast turnarounds and amazing prices. 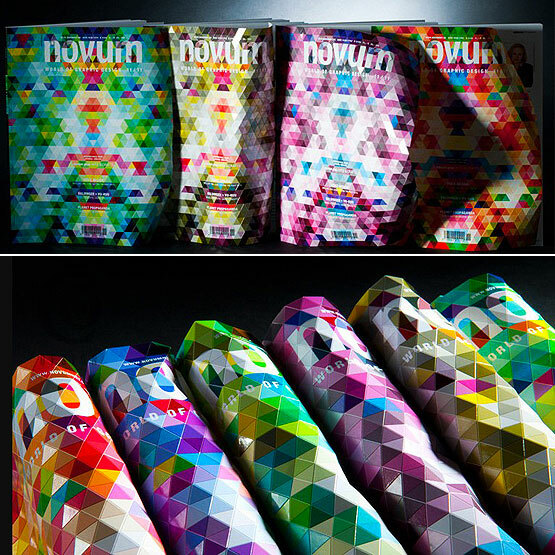 When the graphic design magazine Novum commissioned Paperlux to come up with an innovative magazine cover, the creative juices kicked into overdrive and the result is truly something spectacular to see and feel. Paperlux, a design studio based in Hamburg, Germany, was seeking a way to focus on the palpable nature of paper. The result was a very tactile approach as a way to draw people to a colorful product sporting a geometric design that makes you ache to just reach out and feel it for yourself. 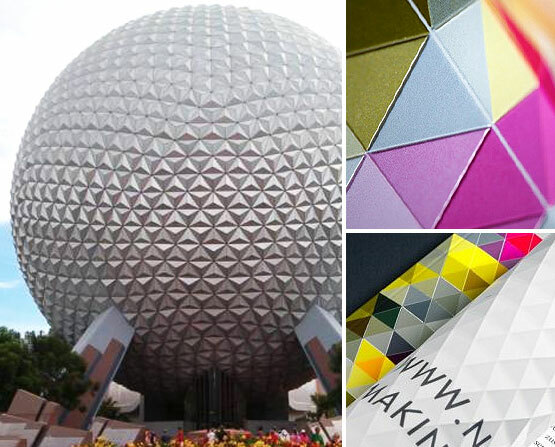 The design was fashioned after what is called a geodesic dome (source). Although the magazine represents a much flatter version of the dome, it still has the texture and look of the real thing. Imagine a world where anything is possible—where dogs sport a luscious coat of pink fur, green cats preen themselves with zebra striped tongues, ruby red snakes have glowing purple polka dots, and rainbow spotted elephants spray orange slices from a mile long trunk. This is the world that Eric Carle dares his readers to imagine. This article is presented by the leader in business card printing with fast turnaround times, Next Day Flyers. 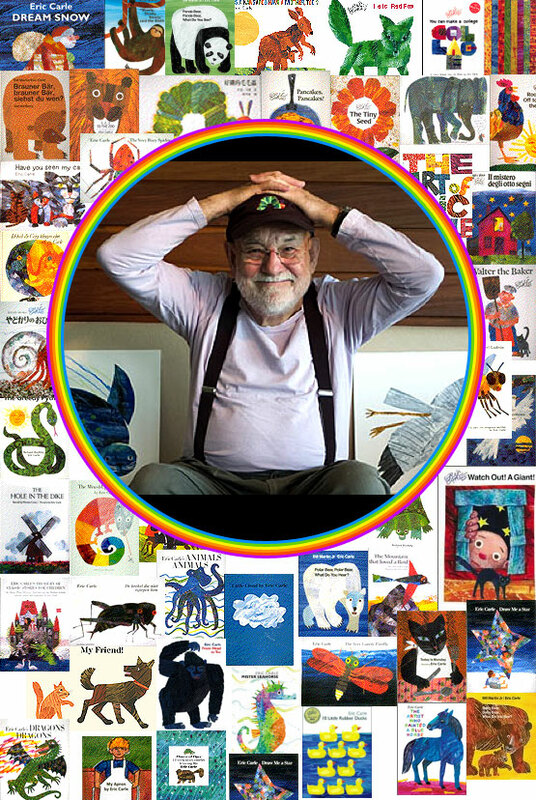 Eric Carle was born June 25, 1929 in Syracuse, New York. When he was six years old, he and his parents moved to Germany where he grew up and eventually graduated from Akademie der bildenden Künste, a prestigious art school in Stuttgart. He never forgot his American roots and returned to the place of his happiest childhood memories in 1952. 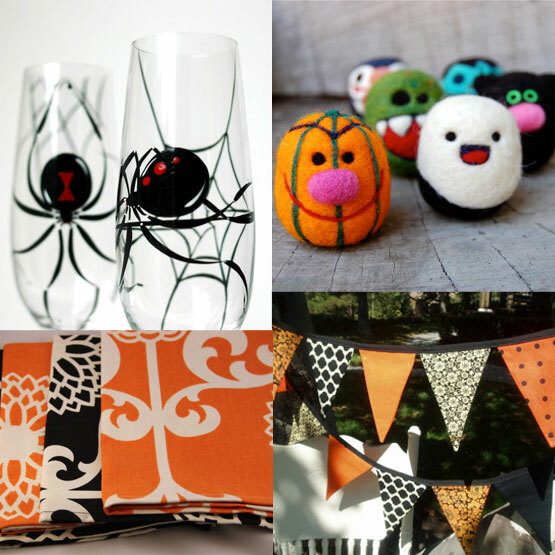 Pumpkin orange and midnight black—the predominant colors of Halloween combine the Autumn season with darkness and scary entities. But how did these colors really come to dominate this most unusual holiday? The truth is, when it comes to the question of the origin of the Halloween colors, it can be hard to separate the opinions from the facts. 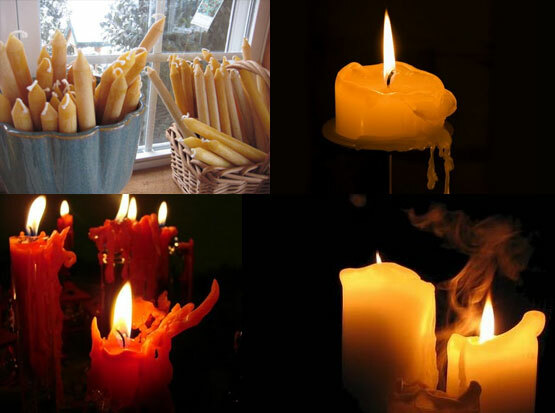 The most common opinion about where the colors originated is steeped in the rich history of the Celtics and the Druids, with the burning of unbleached beeswax candles (orange) and ceremonial caskets draped in a black cloth. Now, let’s step into the world of Feng Shui, where a balance of energy reigns supreme. 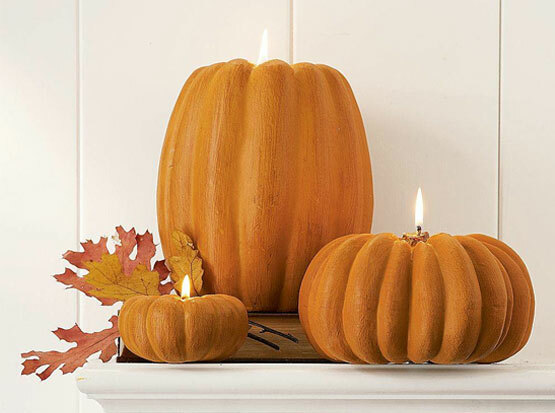 Believers of Feng Shui feel that the colors of orange and black were chosen because they are on opposite sides of the energy spectrum: orange is warm, happy, lively, and brings to mind the bounty of the fall harvest, while black represents mystery, void, power and protection (source). 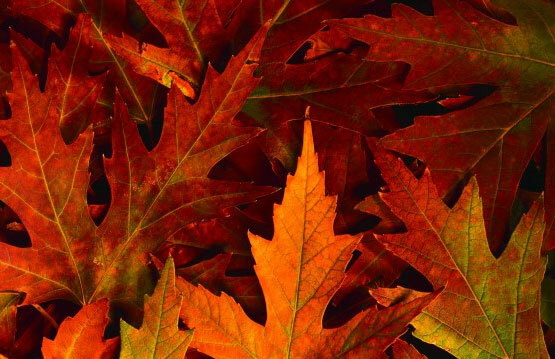 The most obvious answer to this question is that the classic color of Autumn is orange, while black can be equated with the approaching darkness of winter. And, if you want to get really extreme, some people claim that black and orange were the only colors left after Christmas took red and green, and Easter took all of the pastels. Of course, Halloween colors are not just limited to orange and black, you will also see a lot of blood red, eerie green, ghostly white and deep purples. So, where do these colors come into play? Here is a plausible explanation. All of the Halloween colors seem to implicate some kind of connection to death and dying. Red is a classic implication of blood, fire and demons, while green represents goblins, monsters, and zombies. Purple draws in a bit of the supernatural and mysticism, while white reflects ghosts, mummies and a full moon. Stepping away from color for a moment, Halloween is also dominated by an abundance of Jack-o-lanterns and children out trick-or-treating. These traditions also have an interesting origin. Jack-o-lanterns trace back to the Irish myth of Stingy Jack who died and, finding himself rejected by both heaven and hell, was forced to roam the darkness seeking a resting place for his soul. 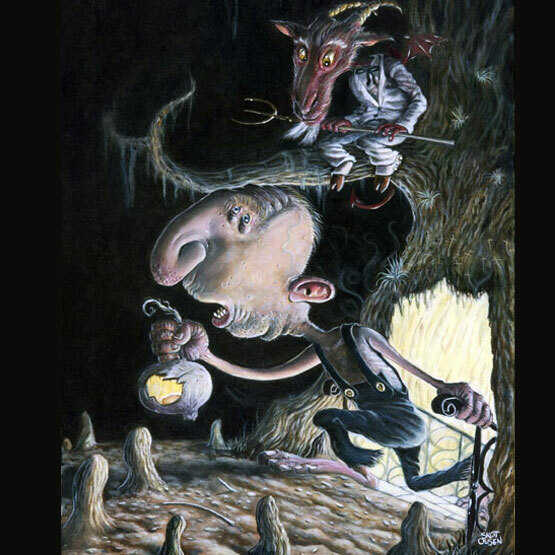 Legend has it that he hollowed out a turnip and used it to carry a coal to light his way. 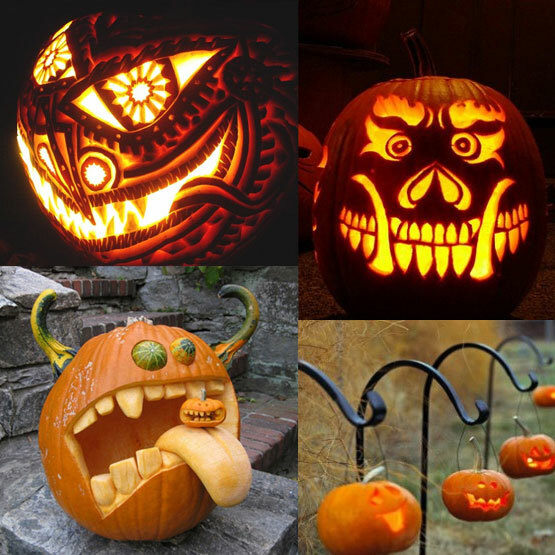 This said, the first Jack-o-lanterns were carved in turnips, and only changed to pumpkins when the tradition was brought to America. 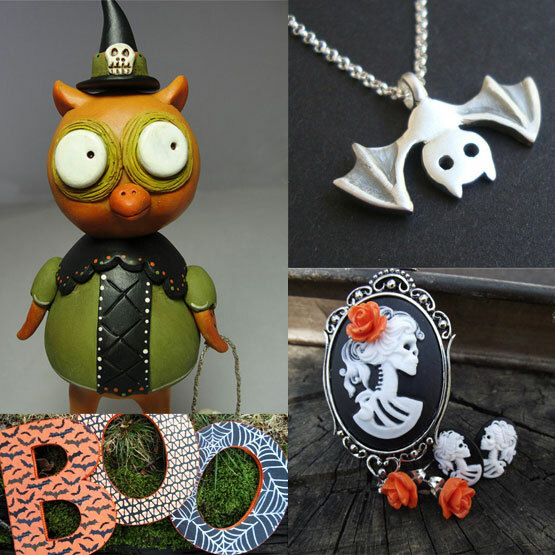 No matter what history tells us, the Halloween color palette we see today is warm, bright, fun, and sometimes a little spooky. Each color has a place in the holiday and can find a place in your life as well, whether you are wearing it, eating it, decorating with it, or simply reading about it. So, have a happy, safe and colorful Halloween! 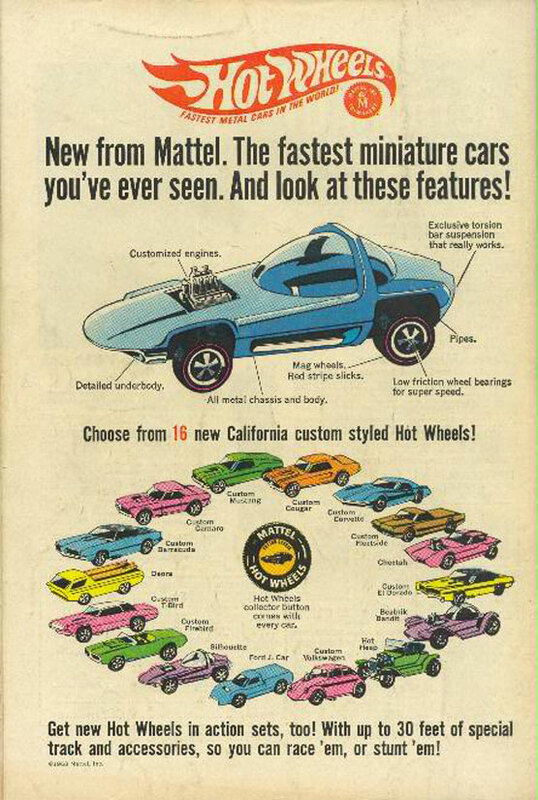 The launch of Mattel’s first line of Hot Wheels cars in 1968 was the beginning of what would become a big part of many of our childhoods. Almost 45 years later, Mattel estimates that about 41 million kids have grown up with their model toy cars, while the faithful enthusiasts have become collectors as adults. So, what was the secret to Hot Wheels' success? For starters, a constant stream of new models and concepts has enabled Hot Wheels to remain competitive. Its rivalry with Matchbox, which had a 15-year head start debuting in 1953, has resulted in a very colorful history that has transformed our entire preconception of what model toy vehicles should or should not be. Often referred to by collectors as the “Sweet 16,” the first 16 cars that were released featured metallic “spectraflame” paintwork in such exotic colors as Antifreeze, Magenta and Hot Pink. Soon to follow were a collection of 48 cars released in the 1970s, which included the Paddy Wagon and models with rotating crash-panels called Crack-Ups. What is the first thing you do when someone hands you a business card? Look at it, of course—and then stick in your pocket/wallet/purse. If it is something you are really interested in you might fish it back out and put it in a place of honor on your refrigerator, or give it a front row pocket in your wallet where all the “things used often” are kept. But, more often than not, the poor business card gets forgotten or lost soon after it is received. 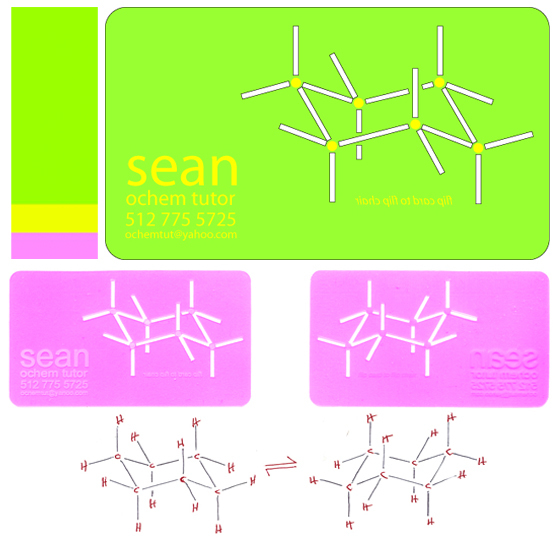 These fluorescent acrylic business cards were designed by an organic chemistry tutor who needed a fresh idea to both generate business and leave a lasting impression. He soon realized that one of his most common teaching tools would make the perfect marketing tool. 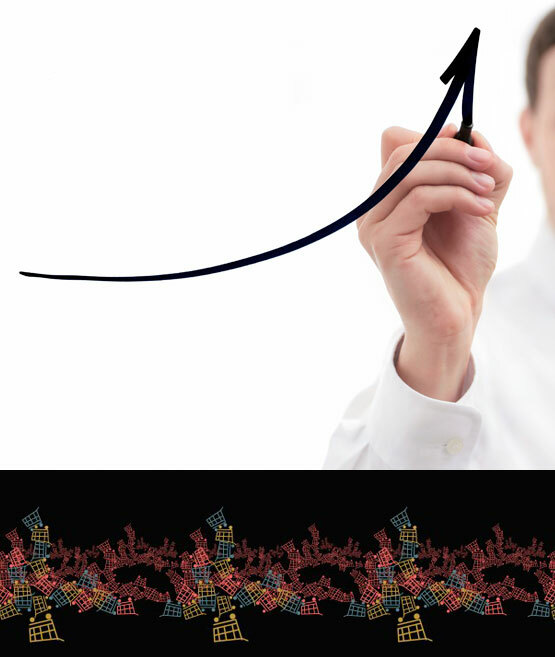 His creation serves the function of a traditional business card, while giving the student a template for drawing diagrams that reveal the “arrangement of substituents on a saturated 6-membered molecular ring” (source). As an added bonus, the colorful glow-in-dark feature makes it useful day or night. 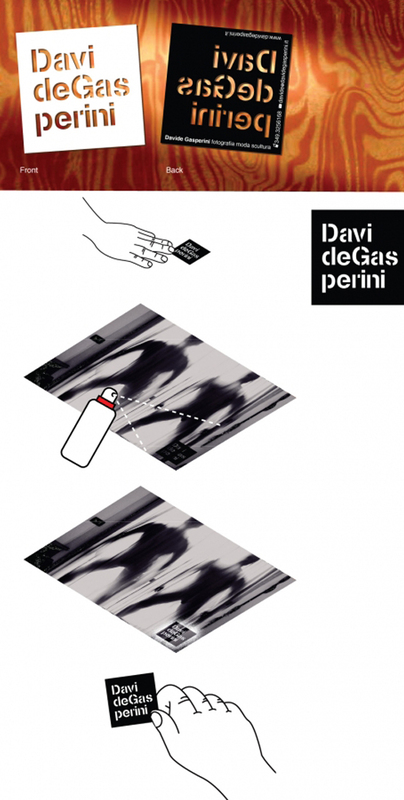 This Italian fashion and art photographer uses his stately black and white business card as a stenciled signature on his original photos. When he hands you his card he is, in essence, handing out his signature. 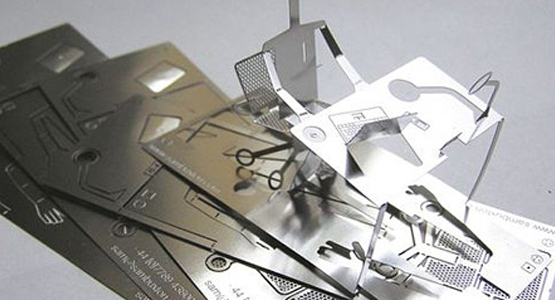 When this Japanese model-kit company hands out a business card, they are giving potential customers a little taste of what they have to offer. 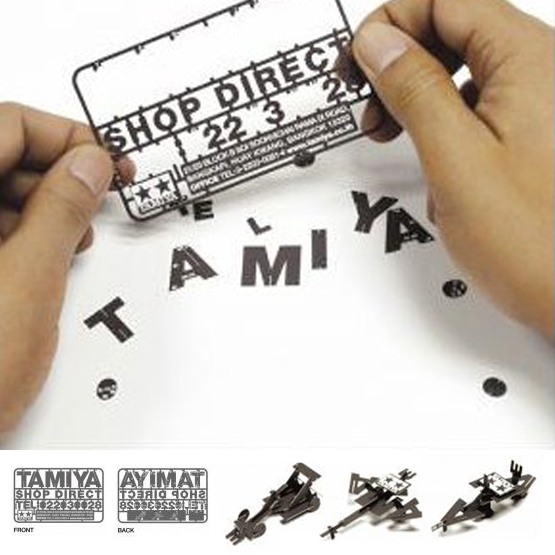 This is no ordinary card, it is actually a miniature model kit that, when taken apart, can be snapped together to create a Formula One car, a fighter-plane, or a warship. Its lack of color is made up for in its potential for giving customers a fun experience. This shiny metallic pop-up business card will look cute on your desk, while serving as an easy reference tool as needed. 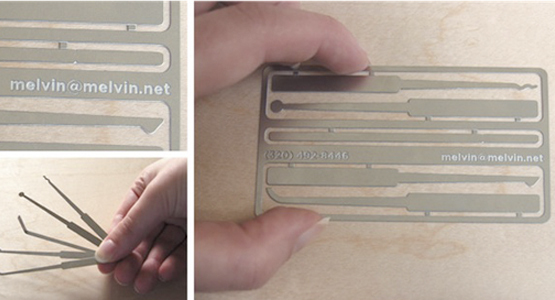 Another metal business card, but with its own bag of tricks—a fully functioning set of lock-picking tools! If you’re a beautician, giving your customers something to brag about is a great way to generate new business. 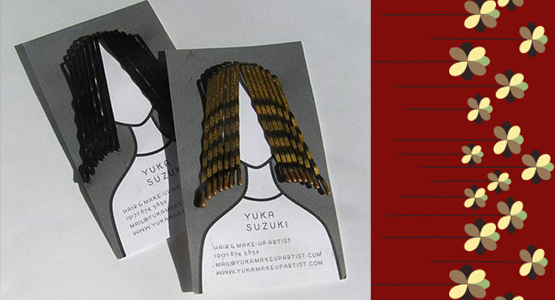 Aside from a great new hair style, what could be more “talked about” than a business card that you can actually wear in your hair? Its simple color scheme adds emphasis to its usability. 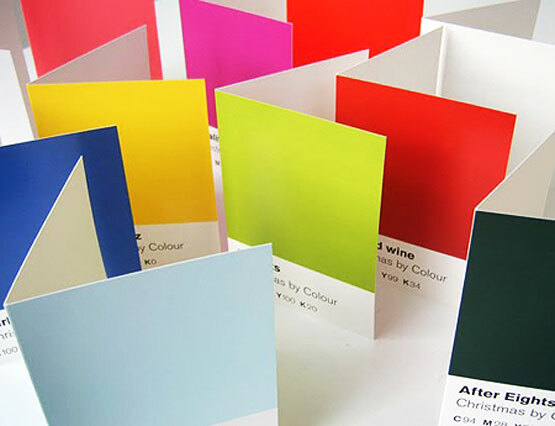 The bright, yet simple two-toned color scheme (and stretchy features) draws your attention to a card that is not necessarily as useful as it is memorable. If you are a plastic surgeon, this is card is sure to get the word out. 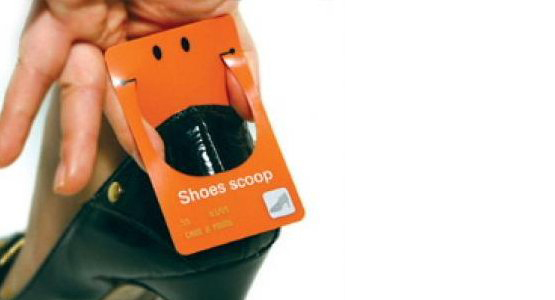 This cheerful orange business card can also be used as a shoe horn. 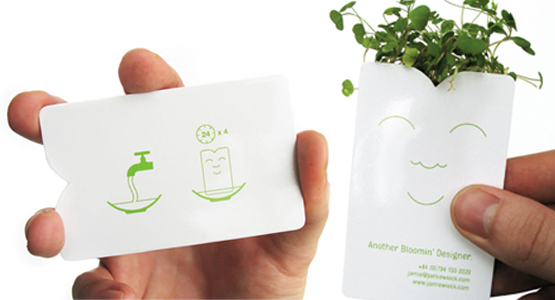 This “green” business card will definitly find a place on a desk, rather than in a drawer. By following the simple instructions on the back it sprouts alfalfa! 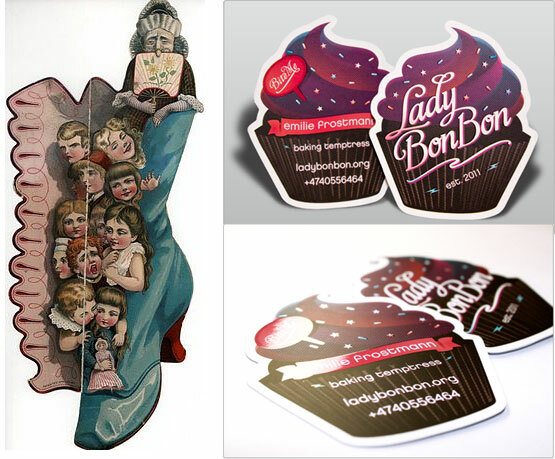 Encouraging potential customers to keep your business card close at hand can be a challenge. But, the reward for your efforts could make all the difference, especially for a small business with a lot of growing potential. While some of these business cards may be a bit lacking in color, here’s to hoping they colored your imagination: What ideas do you have for making business cards more usable? 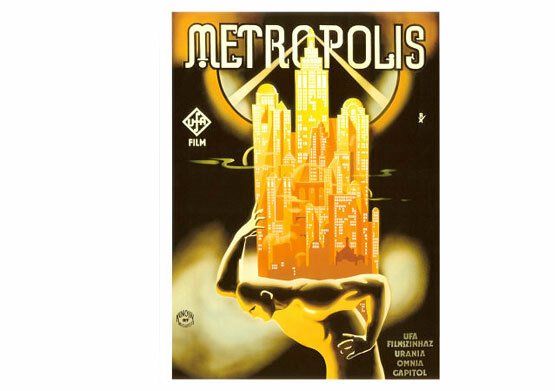 Posters from the 1920s—Art Deco Style! Presented by the offset printing services company, Next Day Flyers. They offer fast turnaround time on printed materials including business cards, postcards, flyers, and brochures. 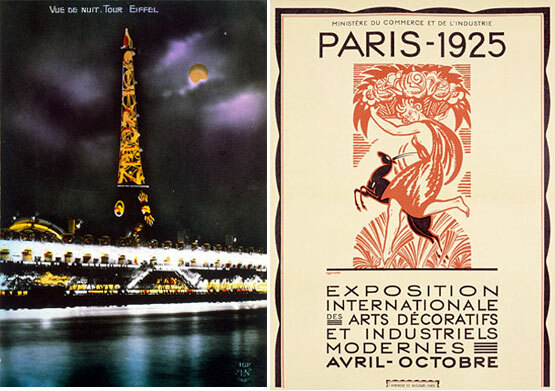 The term Art Deco comes from the 1925 Decorative Arts Exposition in Paris, where people flocked to view a spectacular display of this new type of art. 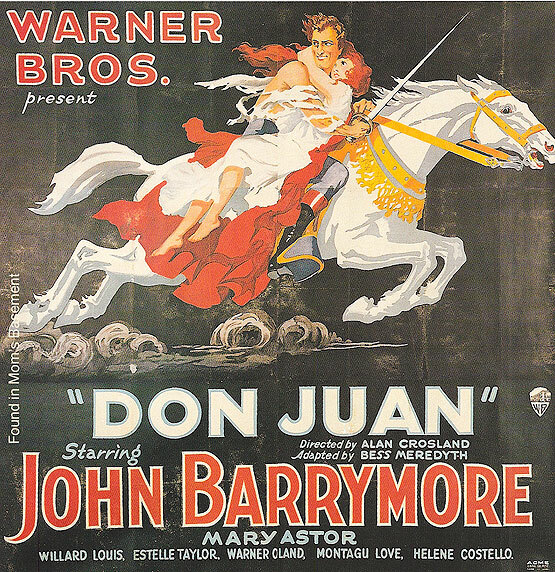 This vintage 1927 movie poster epitomizes a very vivid sense of power that was a popular theme in the posters created in the 1920s. This vintage 1926 movie poster practically drips with brute strength and speed. It also features a variety of lettering styles and colors to add a bit more excitement to the overall picture. Printed in the lithograph style, you will notice that this beauty was laid out horizontally, suggesting that it was used as an insert for advertising on a train, trolley or bus. 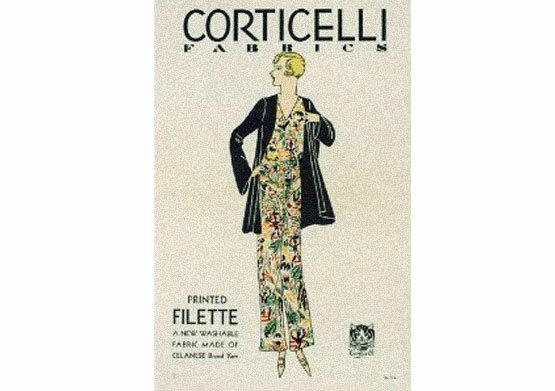 The well-dressed couple depicted in this poster is wearing the flapper-style clothing that was popular in the Art Deco era. Another thing that sets it apart, which cannot be seen in a digital image, is its linen back, which was a common printing surface in this time period. Printed by Quigley Lithograph Co., this rare music poster uses a simple color scheme to draw the audience in and make the lettering litterally pop out at you. 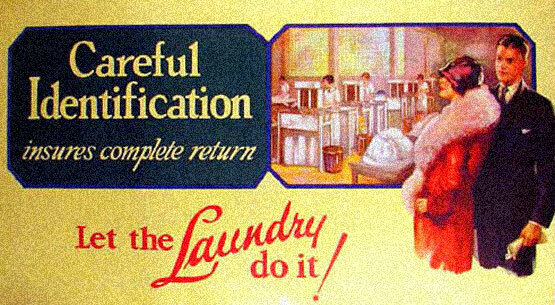 Another interstesting tidbit is that it was mounted on linen and machine folded for distribution. Have you ever wondered how drinking cow’s milk became so popular? 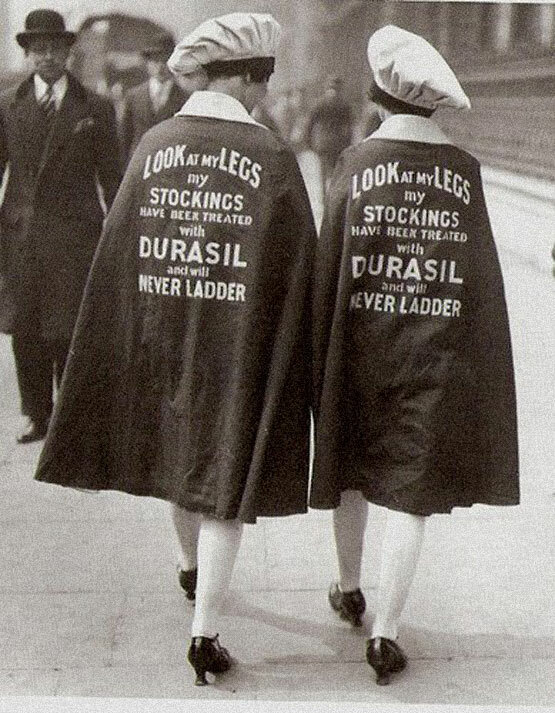 Apparently, the National Dairy Association started its campaign back at the turn of the twentieth century. The bright yellow in the National Dairy Council poster definitely catches the eye. In contrast, the deep shades of color in the Lawrence Wilbur poster showcase illustrative and graphic arts printing methods at their best. Produced by the Dairymen`s League Cooperative Association in New York City, this poster also promotes the drinking of milk by combining the themes of power and speed with a traditional American landscape. 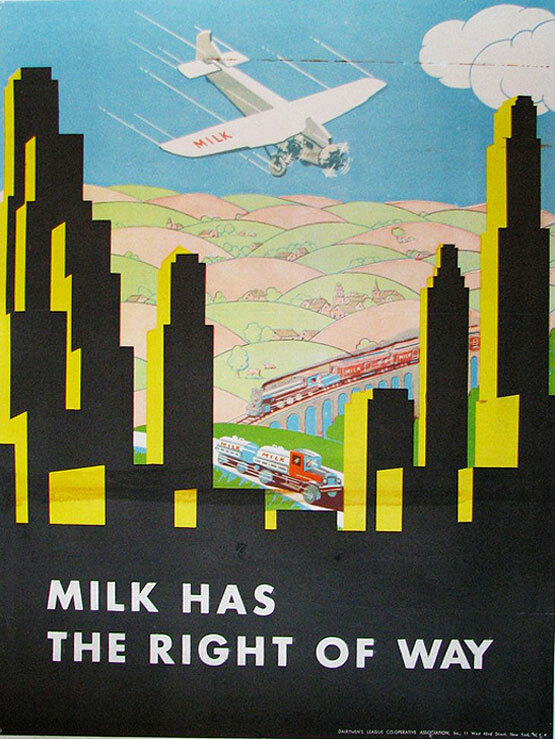 Although the airplane is the focus, this poster offers many other elements such as the machine-age skyscrapers in the foreground encompassing the airplane, a milk truck on a highway and a steam engine train, backed by a colorful patchwork of farm lands. Fashion at its finest! This simple, yet elegant poster uses the idea of “less is more” to convey its message. This work of art reveals lithograph at its finest. 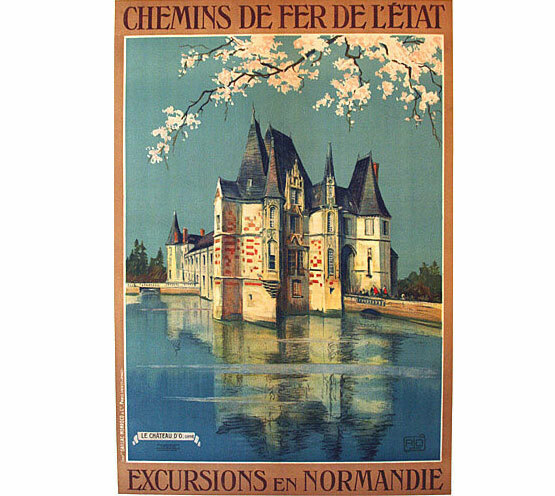 Advertising the French Railway as your host for excursions to Normandy, it was printed in France and designed by well-known French graphic designer, poster artist, and illustrator Charles-Jean Hallo. This poster is unique in that it was printed on cardboard. 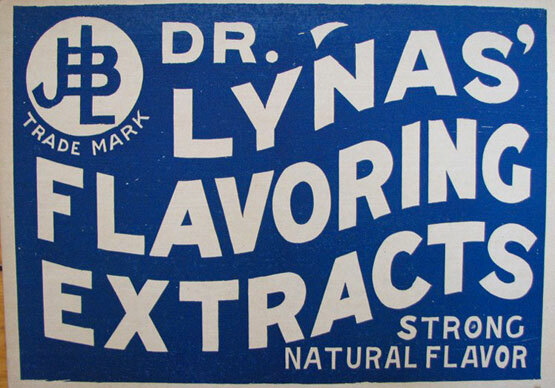 Its bold typography adds emphasis to the fact that Dr. Lynas’ was a well-known brand of the era. This charming photomontage poster mixes text and photo elements to create a sense of expression that is sure make you smile. The detail that went into printing this almost “life-like” gentleman reveals the use of some very detailed and tedious lithography techniques. These “posters” take linen backing to a whole new level. In retrospect, while many posters from the 1920s were detailed works of art, a great many more were simply humorous, cheeky, or down-right ugly. 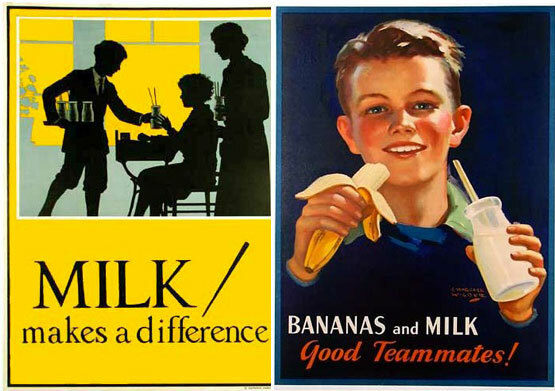 Together, these posters helped to form the foundation of modern-day advertising, and give us great topics to blog about, too! 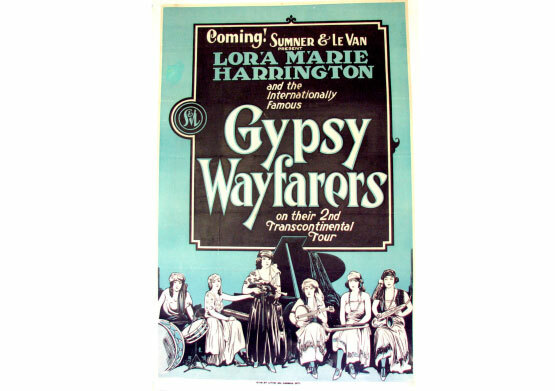 If you would like to find out more about vintage posters, visit http://vintageposterworks.com. This post made possible by Next Day Flyers, the online poster printing company offering fast turnaround times and amazing prices.